For many tourists and visitors to Bangkok one of the most enduring images of the City of Angels is the imposing Golden Buddha, the largest solid gold Buddha image in the world, housed in Chinatown’s Wat Traimit Royal Temple. Chatrium Hotel Riverside Bangkok – Charoen Krung Road – 4 km or 16 minutes by car. Chatrium Residence Sathon Bangkok – Chan Road – 7 km or 19 minutes by car. Emporium Suites by Chatrium – Sukhumvit Road – 8 km or 26 minutes by car. Maitria Hotel Sukhumvit 18 – A Chatrium Collection – Sukhumvit Road – 7 kilometers or 22 minutes by car. 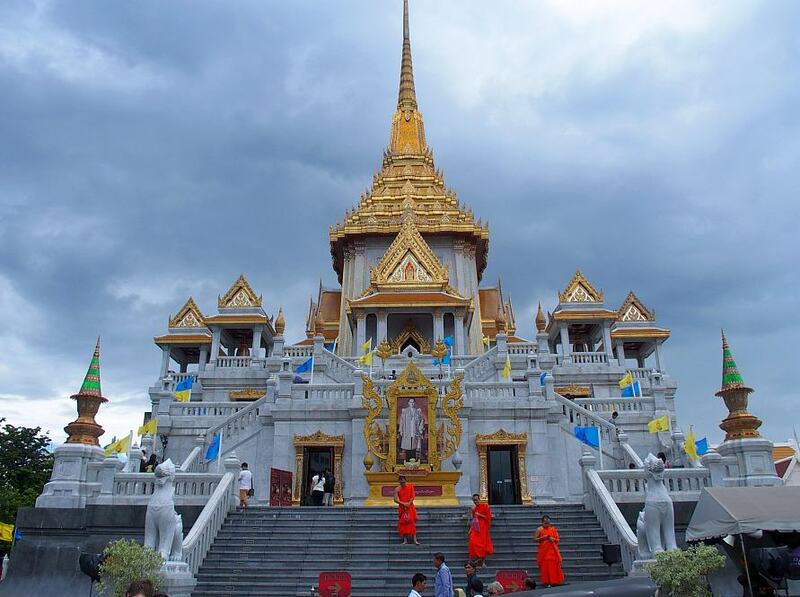 Although known as “The Temple of the Golden Buddha” the official full name of Wat Traimit is Wat Traimit Withayaram Worawihan with the Thai name of the Buddha image being Phra Phuttha Maha Suwan Patimakon. The Golden Buddha was cast with the Buddha image displayed in the subduing Maha Mudra position, one of the many symbolic gestures, or “Mudra”, found in both Hinduism and Buddhism. 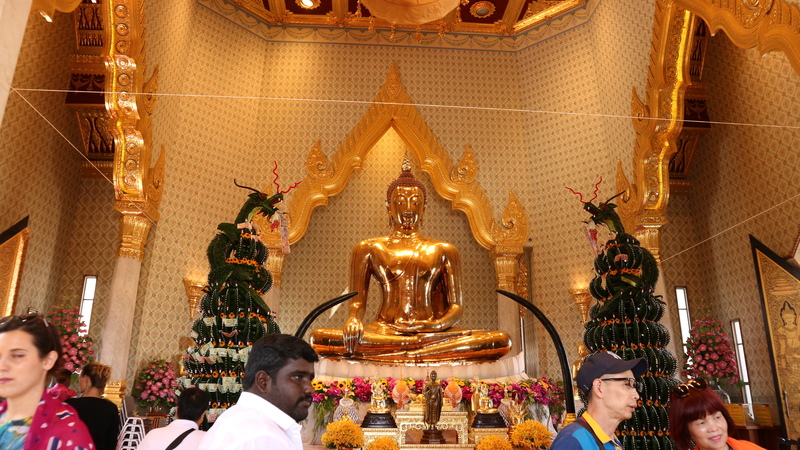 The Golden Buddha stands 3 meters tall and weighs 5.5 tonnes, with an estimated value in gold of USD 250 million. The hair and topknot are 99% pure gold, with the chin to the forehead and body being 80% and 40% pure respectively. The origin of the Golden Buddha is not exactly known, but due to the style of the image is believed to have been cast between 1248 and 1438 A.D. which was the time of the Sukhothai era, a kingdom centered on the Northern Thai city of Sukhothai. After the demise of the Sukhothai Kingdom and the emergence of the Central Thailand Ayutthaya Kingdom in 1350 it is assumed that the Golden Buddha was moved to Ayutthaya, some 80 kilometers north of present-day Bangkok. In 1767 Ayutthaya was destroyed by marauding Burmese invaders and at some point in time before then the Golden Buddha was covered in plaster, perhaps to disguise its enormous value from the Burmese. The Golden Buddha remained in Ayutthaya for many years without attracting attention until the reign of the first king of the current Royal dynasty, King Rama 1, who ordered many Buddhist artifacts to be brought to the new capital Bangkok from the cities of Ayutthaya and Sukhothai, where the threat of Burmese marauders still existed. Initially the Golden Buddha was placed in Wat Chotanaram before being moved to its current location in the 1930’s where, purely by accident, its true value was discovered in 1955 during the relocation of the image to a purpose-built “Wihan”, or Shrine Hall, within the temple’s grounds. During the move a crane cable supporting the image broke and the Golden Buddha fell to the ground. Due to the religious significance of Buddhist artifacts rather than attempt to raise the image the local workmen fled in terror believing that the accident would bring bad luck. The Golden Buddha remained in the mud overnight until being discovered the next day by a monk, who noticed that some of the image’s plaster was broken and upon closer inspection realized that underneath the common coating the image was made from solid gold. And thus the true glory of the Golden Buddha was revealed to the world for the very first time. In 2008, a 3-storey building named Phra Maha Mondop was erected to house the Golden Buddha image, with the 1st floor containing a museum and the Chinatown Heritage centre where visitors can learn about the history of Chinatown and Chinese immigrants in Bangkok. The 2nd floor contains an exhibition on the history of the Golden Buddha and some of the actual plaster coating which revealed the image’s true identity is on display. The top floor of the Phra Maha Mondop contains the Golden Buddha itself for visitors to pray and take in the image’s serene beauty. Previous PostPrevious Sukhumvit’s Sensational for Dining!